Even though we're year-round readers, we appreciate the practice of looking forward to picking up a good book or two over the summer, perhaps to enjoy at the beach or while sitting in our favorite porch chair. And if like some of us you're an eclectic reader, then you’ll find plenty to choose from among these excellent books of fiction and nonfiction. Recently published, these titles explore an expansive emotional territory, from the intimate spaces of home to the chaotic streets and from the devastating choices of youth to the challenges of motherhood. 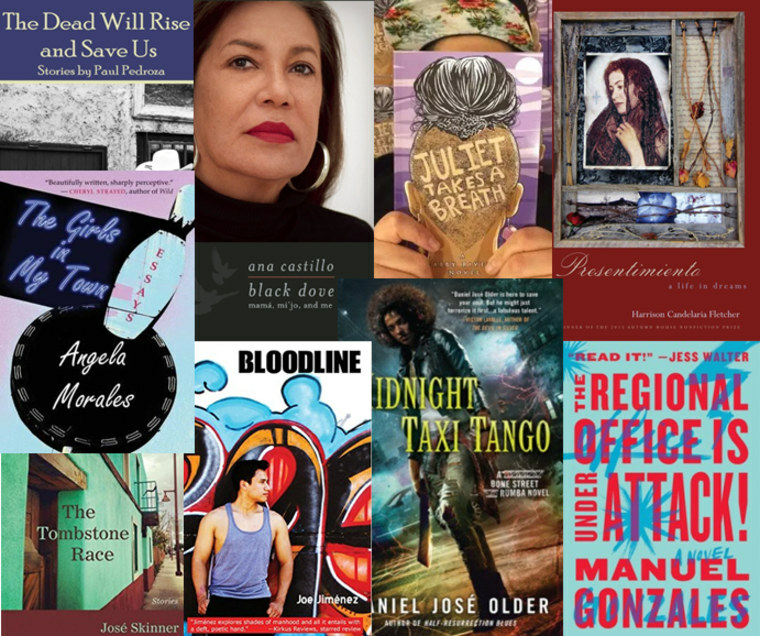 Latino writers continue to share journeys, lived or imagined, that underscore the uniqueness (and universality) of the Latino experience. 1. Black Dove: Mamá, Mi’jo, and Me, by Ana Castillo, Feminist Press. Castillo’s incomparable literary reputation was established by such Chicana classics as "The Mixquiahuala Letters", "Sapogonia", "So Far from God", and "Massacre of the Dreamers: Essays on Xicanisma", which helped define 20th century woman of color feminism/ activism. With Black Dove, a collection of honest (and sometimes painful) essays, Castillo looks back on her blessings and tribulations as a “brown, bisexual, strapped writer and mother.” At the heart of this journey is how her role as a writer and her role as a mother of an incarcerated son intersected and helped both of them through his time in prison. This exquisite memoir is full of compassion and maternal love. 2. Presentimiento: A Life in Dreams, by Harrison Candelaria Fletcher, Autumn House Press. Presentimiento — that feeling, that sense of knowing something is about to happen or is already taking place — is a mystical belief in many Latino communities. Author Harrison Candelaria Fletcher is a journalist and professor living in Virginia. Coming home to his New Mexico roots, a feeling overwhelms him as he enters his mother’s home: something is fading fast, something is about to be lost. And so begins the act of recovery, one image at a time, one memory after another, in order to anchor himself to his aging mother’s story—to their ancestors’ stories—before everything is irreversibly forgotten. A loving and moving portrait about what sustains us after accepting the frightening knowledge of our mortality. 3. The Regional Office is Under Attack!, by Manuel Gonzales, Riverhead Books. Gonzales’ debut collection of stories "The Miniature Wife" defied easy categorization though its muses were clearly the Latin American magical realists. With this powerhouse of a novel, the surreal elements are also drawn from the Robert Rodriguez/ Quentin Tarantino school of filmmaking (think "Grindhouse" and "Kill Bill".) The sheer pleasure of this loud-pitch journey is in watching a crew of female assassins flex its muscle as each woman’s story rises to the surface to reveal an entirely different (and more appealing) narrative than the book’s title promised in the first place. An entirely original and entertaining novel. 4. Bloodline, by Joe Jiménez, Piñata Books. Written in the second person point of view, "Bloodline" places the reader front and center of this tragic San Antonio stage in which troubled teenager Abraham struggles against the violent tendencies that he suspects are his regrettable birthright. Inspired by Shakespeare’s "Hamlet", Jiménez adds a Chicano dimension to his story (cue in Uncle Claudio) but preserves the conflicted, inner turmoil of the main protagonist to deliver this stunning family drama about the hard lessons of coming into manhood. Known for his compelling poetry, Jiménez brings his gift for gorgeous imagery and description into this magnificent story written specifically for a young adult audience. 5. The Girls in My Town, by Angela Morales, University of New Mexico Press. Set in California’s Central Valley and LA, Morales taps into the stories of Latina girlhood as lived by four generations of women illustrating that this impressionable age is as full of wonder, humor and heartache as any other. The harsh realities of family conflicts and risks of falling in love — “the darkness and the edges of everything” — always loom close to the moments of playful innocence. Winner of the River Teeth Literary Nonfiction Prize, the twelve essays in "The Girls in My Town" take an honest look at the rich experiences of girls trying to make space for their intelligence and imaginations. This is Morales’ first book and an auspicious debut. 6. Midnight Taxi Tango: A Bone Street Rumba Novel, by Daniel José Older, Roc. Fans of the Bone Street Rumba series will delight in the sequel, in which Carlos is guided through his next high-adrenaline adventure by Kia, a street-wise teenager, and Reza, a mercenary with a heartbreaking story of her own. This urban fantasy novel set in multicultural Brooklyn will send readers to Older’s other current literary success, which also features an outstanding female adolescent protagonist, Shadowshaper. 7. The Dead Will Rise and Save Us, by Paul Pedroza, Veliz Books. Pedroza’s searing look at the Texas-Mexico border landscape comes across grim (“never is there a shortage of majestic Dead in this dry and useless land”) but the glimmers of hope (and love) cannot be extinguished for his characters, who must imagine new ways of overcoming their dire situations. Some place their faith on sports, others on education, and some, like the narrator of the title story, turn to the stories of the dead—in this case, of people who have perished in vehicular accidents—to make peace with grief and the sense of alienation from one's own community. Pedroza’s well-crafted prose casts a positive light on these somber but poignant stories. 8. Juliet Takes a Breath, by Gabby Rivera, Riverdale Ave Books. Rivera’s young adult novel moves beyond the “coming out” narrative by shaping a story that traces a young woman’s negotiation of her personal, political and professional spaces as she comes to terms with a queer Puerto Rican consciousness. Juliet Milagros Palante’s journey from the multicultural Bronx to white hipster Portland allows the novel plenty of “fish out of water” levity while dealing with serious issues such as racism, homophobia and body image. Juliet is a refreshing representation of intersectional identity and, admirably, Rivera isn’t shy about delving into the intimate world of lesbian sexuality. A groundbreaking book. 9. The Tombstone Race, by José Skinner, University of New Mexico Press. University of Texas-Pan American professor José Skinner’s long-awaited second collection measures up to, and indeed surpasses, his critically acclaimed debut "Flight and Other Stories" published 15 years ago. Set in various towns of New Mexico, each story appears to answer the burning question posed by one of Skinner’s memorable characters: “If you woke up from your life, would you tell it as a beautiful dream, or as a nightmare?” Sometimes the answer is much more complicated as in “The Edge,” in which a man’s fall from a canyon offers him a chance at a new beginning when he realizes he’ll be presumed dead. This story also illustrates Skinner’s skillful use of the New Mexican landscape to affect plot. Such dazzling storytelling was worth the wait. Follow NBC News Latino on Facebook, Twitter and Instagram.